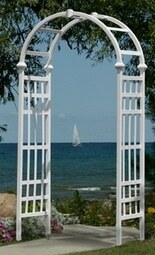 We are going to look at several Garden Arbor Designs that will have different purposes in your outdoor space. All will be able to grow a climbing plant on them. Materials that they are made of will give you some kind of idea how long they will last in the outdoor environment. First you must look at the space you have and decide what type will work best for you. After reading if you have any further questions please use the form below. This ornate wrought iron arbor is great for an entrance to a garden area or just decoration on a path to your favorite spot in your outdoor space. Can be purchased with or without gates. The bronze finish is powder coated, but does not weather very well. Most customers painted with a clear coat or finished in a color that would better match their outdoor decor and had no issues with the finish year after year. 7 inch ground stakes add to the stability of this unit. Some customers state that it will withstand 75 to 80 MPH winds. The product arrives in one box that will weigh about 50 pounds. It is made of a square iron tubular frame. When assembling some assistance will be required, the unit is too tall for most people to assemble by themselves. When assembling make sure the parts are in the right side as the top sides do not interchange. Directions are a explosion drawing that some find difficult to follow. If you opt for the gates, the hinges are not adjustable, you will have to make sure the surface is flat so that the gates will align up. The size is 54 inches wide, 23 inches deep and 84 inches high. This includes the 7 inch ground stakes for stability. The height of this arbor is between 75 and 78 inches depending on the depth of the stakes in the ground. Once assembled and in the correct location all you have to do is plant some sweet peas, climbing roses or clematis. Some people like their arbor just the way it is and do not want to cover the Burnished Bronze finish with any plants. If you are looking for an oversized simple arbor for your garden area this extra large arbor will be for you. The archway is pointed at the top and is made with metal finished with a black powder coat. The bars on the side will let your climbing plants cover this arbor in no time. It will be ready for vines or climbing flowers in no time after simple assembly. Your arbor will be 61 1/2 inches wide, 18 inches deep and 101 inches high. The are several advantages of a vinyl arbor over a wooden or metal arbor. The vinyl will not get boring insects, will not need painting, staining, sanding or stripping, will not rot and mildew, warp, crack, or peel. Most vinyl arbors come with 20 year warranty on the materials. The arch top design of this vinyl arbor is what sets it apart. It will be long lasting and require very little maintenance with the white weather-resistant vinyl construction. The lattice on the sides will be perfect for your climbing plants. Assembly will be easy, will require two people in most situations. Ground anchoring stakes are included, other installation methods will be either concrete foundation/burial or an anchor kit, these are not supplied and must be purchased separately. Your arbor will be 39 inches wide, 23 inches deep and 84 1/2 inches tall (without burial). The package will be almost 19 pounds. Looking for a flat top pergola style in your outdoor garden arbor, the Fairfield Arbor will make a great focal point in your outdoor space. 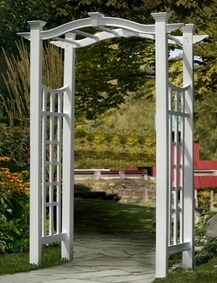 Use your flat trellis-top arbor to highlight your entrance or items in your outdoor garden area. Made from a white maintenance free vinyl material that will require very little cleaning, just wash off with the garden hose. Assembly and installation will take little time and may require two people. Installation can be done by adding 4 X $ treated post inside the uprights and planting with concrete. An add on is a Aussie Augers mounting kit that you do not have to use concrete to mount this Arbor. Each of the four pieces will be 4 inches square and 24 inches tall. You can order a Cottage Picket Gate kit for this Arbor also that will match the design. This gate is 50 inches wide, 4 inches deep and 43 1/2 inches high. The Fairfield Arbors is 59 inches wide, 33 inches deep and 86 inches tall with a 50 inch opening. The arbor will weigh 76 pounds in the package. This Vinyl arbor will add a architectural design to you outdoor space. Add in to an entrance to your garden or sitting area will help separate the areas to make it seem like you have many rooms in your living area outdoors. Made of rot and mildew resistant white vinyl, it will last a long time. This arbor will be almost maintenance free, just rinse with the hose it will keep your arbor looking like new year round. Assembly and installation is easy for this unit. Instructions are easy to read and follow. Assembly will be easier if two people are involved, as this product is tall when completed. Installation will require to either set in concrete or some people opted to drive steel re-bar in the ground. Your arbor will be 49 inches wide at the outside and 42 inches wide at the inside, 24 inches deep and 93 3/4 inches tall without any burial of the legs. The post are 2 inches deep by 3 1/2 inches wide when looking from the front. The box will weigh 47 pounds when received. Many flowering plants will grow on a Garden Arbor. Climbing Roses, Morning Glories, Purple Wisteria, Honeysuckle, Trumpet Creeper, Cross Vine, Mandevilla, any Ivy and White Jasmine to name a few. You choose the color and fragrance that would like to adorn your outdoor space. You may want to stay away from any fruit bearing plant, as they will attract Pest and leave a mess on the ground. If you choose a plant that looses it leaves in the fall, the winter sun will shine through. Check with the local plant person to make sure that your choice of plant will handle your local growing conditions. Making the correct choice will enhance the beauty of your outdoor space. I hope that you have taken some of this information to help you design the look of your outdoor space. Garden Arbors will give you a look in your outdoors that your neighbors and friends will talk about. Many different styles are available and you can change the look with the style of plant you have growing. I love to be outside and this is a great site for me to decorate my outside living space. Right now it is not the best time for me due to my money situation. But once I get some more money it will be easier for me. Do you have any cheap alternatives for decorating your outside living space? What are you looking for. I mostly just blog about room items. Are you looking for seating, lighting, arbors or heating… need to know about your needs. A really nice site you’ve got here – my partner is very impressed by the ideas you have here ( which is a bad thing as it will end up costing me money!!! ). These arbor designs – are they built with a particular country in mind? I only ask as the climate in my country ( UK ) tends go get pretty extreme at times…at winter especially!!! The white Vinyl ones will do nicely outside in your weather. The metal ones will not last as long and will take more maintenance to keep looking nice. If it is real windy, I would recommend maybe a ground wire on each side to stabilize your arbor. Nice blog on outdoor arbor designs. I have learned a lot from this writing of the different types of garden arbors, and all of the beautiful designs and purposes they have. I really like the many advantages of having a vinyl arbor, and lasting much longer than other types. I would love to have one of these with red climbing roses all over them. The vinyl examples will cost more up front, they will last a long time. The types of vegetation that you can grow will vary by location. Our garden in our summer house needs some redecoration so your post really helped me. You gave me some great ideas. I love the Montebello Garden Arbor! It looks so romantic! I really want to get something like this one! Thank you for the recommendations! I can’t wait until September to redecorate my garden! When you redo your garden remember this site, I will be adding more stuff to showcase your outdoor space. Beautiful article about Garden Arbor Designs! 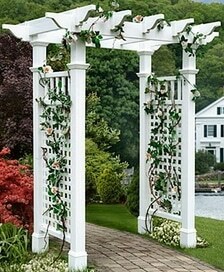 I like how you listed each arbor design in a great layout with good structure. What do you think about the idea of adding a price range for each arbor design so the audience can know the range they are working with? Thanks so much for sharing and Iâ€™ll make sure to check this site out for more information in the future. Pricing is something I have never used on my site. If a person is interested in the items, I have a link to the page with the pricing. Too hard to keep up with the changing price on many items. Price range may be something I can add. 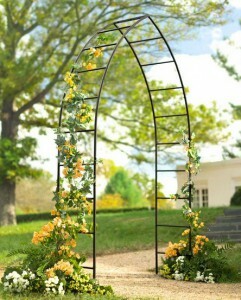 My friend will definitely love these garden arbor. She has been trying to find one but just does not know where to get. Your article reach me at the right time! Btw, can the colour be changed? Or the product is fixed as per seen? I will get her to contact you asap. The color can be changed on either the metal or vinyl. You must use the proper spray paint for the application. They make a special paint for the vinyl that is supposed to not peal like it use to. The metal will just have to have a cleat coat on it to make it last longer. Thanks for such a thorough breakdown. We have the Athens Arbor in our backyard. We bought one for our outdoor wedding and didn’t want to just get rid of it when we were done. We did something similar by letting some climbing plants and vines grow on it. I would have to agree with you on the wrought iron. The front porch of our house was made of that stuff. It rusted very quickly after about 4-5 years and a lot of the white turned brown. And it just crumbles apart. I will share this page with my wife as we’re thinking of adding another one of these in our backyard but want something different. The wrought iron Arbors are not made for long term. The vinyl Arbors will last as long as you take care of them. I will be posting Cedar Arbors shortly, look for that post. Great site you have. Lot’s of useful information. I’m in the process of reorganizing my own garden and was looking for cool arbor designs. I especially liked the Fairfield Arbor type I think. I thought of making my own from scratch, but I guess it’s best to buy from a garden supplier, don’t you think? Depends on how handy you are. The kits here are simple with all of the hardware. If you were wanting to build on your own, some plans are available, then you would have to get all of the items together that you would need. This could be trips to several locations. The cost of these kits would make sense then. I Just commented on your other post about led lights and truly seeing this garden designs is so beautiful too for outdoor purposes. good job on educating us on good ideas and designs.. my site is about indoor designs and ideas so I am happy to learn more about outdoors..
Keep coming back to see my new information. I will be adding at least 2-3 post every week. I eager to teach anyone about the new items available for your outdoor spaces. I really like the look for the Florence and Fairfield arbors. But I’m not a huge fan of the vinyl material. I really like the wrought iron look. Can I find these sorts of styles in wrought iron? Also, what vines flower and grow quickly? They don’t have to grow in very thick either; I would still want to see the arbor itself. The old look of the wrought iron will only be available in smaller Arbors. Any number of vines will grow quickly, the ones that grow fast will also be very thick and have to be trimmed. Flowering vines will attract many insects also. Awesome website John! For me, it was a like a trip into Home Depot. I can get lost for hours and only buy one or two things. You have a lot of great information. I was especially interested in the solar powered lights. I’ve been looking for a method to put lights on my outdoor stares. I’m a little safety conscious and have motion sensors around my property, but the solar powered deck lights are a great idea. Thanks for the temporary escape. I like being compared to a big box store. I do not have as many products. The solar lights for the stars will let you light up the stairs without extra wires or equipment, just one unit on each step. I like the solar lights on the top of each post top, they were easy to install and do not require much maintenance. Your site is beautiful! I really like your orginality. Your content seems very uniqe to me. There are a lot of good stuff here. I bookmarked you site, coming back her for sure. Your Outdoor Fireplace Chimineas is amazing. Seems like you know how to create good content. Nice work on this site. I have a variety of items for all types of outdoor spaces. Many people just have a small area to spend their time outdoors. I am lucky that I have a large yard to play in. Thank you for your interesting site lots off information. Very nice ideas and would love to use some of them. But living in Canada where we have 8 months winter this will not work. Will have a look into the fire pit ideas that should be cool to use here by us. Canada does not allow you to have an outdoor space like in the warmer areas. I have a three season room (enclosed room with just storm windows), this allows me to be almost outside even in the winter. It has 17 windows and two doors that have glass from floor to ceiling. I have a heating and AC unit just for this room. I can use this room 9 months out of the year without a lot of extra heating and cooling. Some kind of wind and weather shelter is what you need to enjoy the outside without being uncomfortable. Iâ€™m not much of an outdoors person, although, I do enjoy hiking. This information is comprehensive and detailed. I like reading these kind of reviews. A substantial review can be quite helpful for someone such as myself that doesnâ€™t want to spend much time with the shopping process. Thanks for the write up and the images. I particularly like the Fairfield Arbor. Even if you don’t have a large outdoor area, you need to get out and enjoy the benefits of being outside. Garden arbours are so beautiful – and there are so many options as what you can do to decorate them. My Mum has one in her garden with a low gate and has climbing roses all over it. She also has fairy lights entwined round so it looks lovely any time of the year, especially in the summer when the weather is nice. Have you seen any arbours with gates and a fence (more like an archway) that you would recommend? 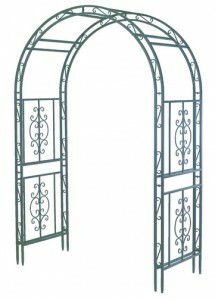 The Montebello Garden Arbor in this article has a gate option and is arched. My aunt was looking for one of these last fall. My neighbor has one that needs reworking. I think this will be something on my list for spring, as we have a pathway that needs a gate. An arbor will make it much more appealing. the site title garden arbour designs immediately roused me and I was instantly curious so I knew that I had to read it. This is what I basically found. Well I found the post to be really informative and your crisp clean images made it all the more easy to visualize the features in my own garden so I must thank you for that sir. A job very well executed and I think that you will go far with this kind of work. Thanks for the good comments on my content. I try to express in words the items in much detail.